A new print and the return of some old friends! A little while back I showed you some the logos for some new prints I was working on. 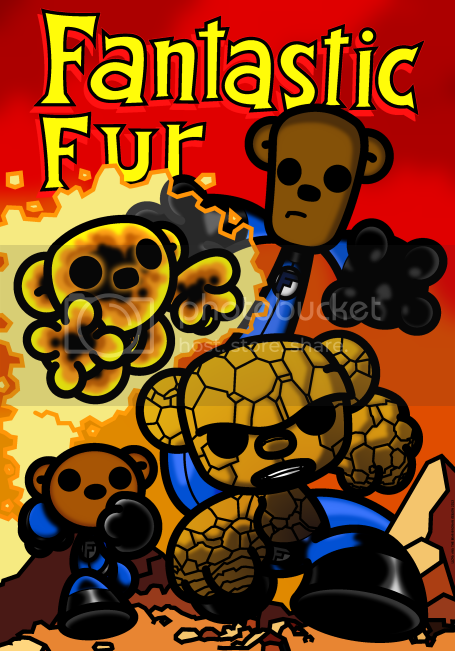 Well this week I’m going to show you some of the new prints starting with…… the Fantastic Fur! This was the cover to issue #509 of the FF book during one of it’s best runs when Mark Waid and the late Mike Wieringo were on the book. I just loved this cover as it was a great team shot (although upon studying I was surprised how dark and moody the colouring was). The logo was a really interesting one to work on as the character set is pretty random with no definitive font or line used. Still great fun putting together. And hey, check the cast! We have Kanus, Mira and Mitsos who we last saw in the first arc of our book! When I was thinking of who to put in as the other characters alongside Bear they seemed like the obvious choice and then it wasn’t until I started drawing them did I realise that there was a real strong character resemblance with that of the FF! Weird. So anyways, hope you like the print and come back more as I’ve another one to show you!